A one-stop location for planning documents, regulations, and information pertaining to the Eastern Bypass development process. We did all the digging so you could do all the reading. 1.3.1 Section 4(f) evaluations - These are the FHWA's requirements for building a transportation project through a public park. FHWA urges legislators to exhaust all other possible routes before taking this option. 1.3.2 Ecosystem and vegetation management- FHWA's planning process for ecosystem and vegetation management. 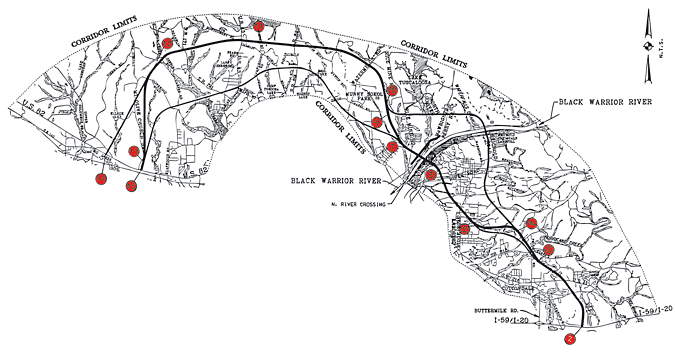 1.5.1 Drawing of bypass bridges over Hurricane Creek with highlights to emphasize bridge and water relation. 1.5.2 Deed 2008- 12951 in which Trust for Public Land purchases Property from the Park family. 1.5.3 Deed 2008- 19607 in which PARA purchases from the Trust for Public Land. 1.5.4 Deed 2010-13729 in which Alabama Power Company purchases access road easement from PARA with respect to Property. 1.5.5 Deed 2010- 17359 in which PARA sells 36.70 acres of Right-of-Way and 39.730 acres of "Uneconomic Remnant" to ALDOT for around $263,000. Includes map image. 1.5.6 Deed 2011-2185 Re-recording of PARA to ALDOT conveyance. Original deed was not dated on a certain page. 1.5.7 Deed 2011-4422 Re-recording of ALDOT to PARA easement. Original deed was not dated on a certain page. 1.5.8 Deed 2011-4430 Re-recording of ALDOT quitclaim to PARA of the "Uneconomic Remnant." Original deed was not dated on certain page. This is the municipal group responsible for ultimate decisions about the bypass. 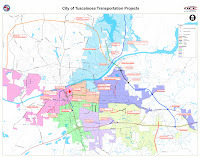 The MPO (Metropolitan Planning Office) Policy Committee serves as the official decision making body for the Tuscaloosa Area transportation planning process. In this capacity the Committee determines how federal transportation funds are spent in the study area. The responsibilities of the Policy Committee include providing overall guidance to the planning process, review and approval of all process plans and programs, and appointing TCC and CTAC members. The MPO usually meets on the last Monday of even-numbered months. Most MPO's are made up of a policy or executive board, technical and citizen advisory committees, a director, and staff. The Alabama Department of Transportation decides what private companies and individuals will be awarded various building projects. They are also involved in land acquisition and uses of the takings clause where needed to remove residents from certain properties. Located on Skyland Blvd., the ALDOT Fifth Division is responsible for transportation planning in Tuscaloosa county and surrounding counties. The FHWA is the group which disburses the federal highway funds required for the construction of the Eastern Bypass. As such, it is the ultimate source of financing behind the Bypass. State transportation officials are required to comply with rules and existing practices to receive this funding. Section 4(f) evaluations - These are the FHWA's requirements for building a transportation project through a public park. FHWA urges legislators to exhaust all other possible routes before taking this option. Ecosystem and vegetation management- FHWA's planning process for ecosystem and vegetation management. FEMA has been involved in planning the rebuilding of parts of Tuscaloosa damaged by the 2011 tornadoes. This plan was created through cooperation between ADECA and FEMA. It does not mention the M-bend park, but it does mention creating a walking area with paths to the creek. 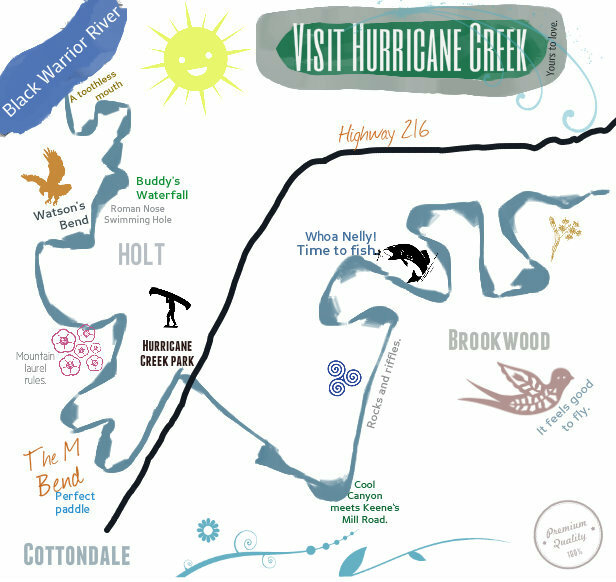 PARA is involved in this plan because Hurricane Creek Park, owned and maintained by PARA, was acquired by ALDOT under a "protective purchase agreement" for the purpose of building the Eastern Bypass. To learn more about the legal aspects of this purchase, the Friends of Hurricane Creek visited our County Courthouse and made copies of these documents to share with the public. "Property" in these document descriptions refers to 200+ acres currently designated as Hurricane Creek Park. Drawing of bypass bridges over Hurricane Creek with highlights to emphasize bridge and water relation. Deed 2008- 12951 in which Trust for Public Land purchases Property from the Park family. Deed 2008- 19607 in which PARA purchases from the Trust for Public Land. Deed 2010-13729 in which Alabama Power Company purchases access road easement from PARA with respect to Property. Deed 2010- 17359 in which PARA sells 36.70 acres of Right-of-Way and 39.730 acres of "Uneconomic Remnant" to ALDOT for around $263,000. Includes map image. Deed 2010-7365 in which ALDOT quitclaims back to PARA the 39.730 acres of "Uneconomic Remnant." 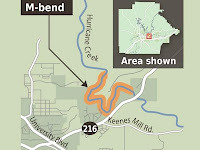 Includes map image. Deed 2010-17370 in which ALDOT conveys two specified easements which will be the only way to cross the bypass highway from one side of the park to the other . The easements are to run under the bridges crossing the creek and are conveyed for the specific purpose of a public walking trail. Includes engineering drawings of the bridges and the easements. Deed 2011-2185 Re-recording of PARA to ALDOT conveyance. Original deed was not dated on a certain page. Deed 2011-4422 Re-recording of ALDOT to PARA easement. Original deed was not dated on a certain page. Deed 2011-4430 Re-recording of ALDOT quitclaim to PARA of the "Uneconomic Remnant." Original deed was not dated on certain page. The EPA is involved in any large transportation projects using federal highway funds. It ensures that our nation's natural resources are being acknowledged and protected during these processes. It certifies sound management practices for local ecosystems, forests, and wildlife. Alabama Department of Transportation, will prepare and circulate for comment a Supplemental Draft and a Final Environmental Impact Statement (EIS) for Alabama Highway Project DPI-0080(001) Tuscaloosa County, Alabama. FOR FURTHER INFORMATION CONTACT: Mr. Joe D. Wilkerson, Division Administrator, Federal Highway Administration, 500 Eastern Boulevard, Suite 200, Montgomery, Alabama 36117, Telephone: (334) 223-7370, Mr. Jimmy Butts, Director, State of Alabama Department of Transportation, 1409 Coliseum Boulevard, Montgomery, Alabama 36130, Telephone (334) 242-6311. ERP No. D-FHW-E50291-AL Rating EC2, Tuscaloosa East Bypass Project (DPI-0080(001), Construction from I-59/I-20 east Tuscaloosa and Newport to US-82 near west of Newport, Funding, NPDESs Permit, COE Section 10 and 404 Permits, Tuscaloosa County, AL. Summary: EPA's review found that wetlands and especially upland hardwood forests would be impacted by the project. Information on resource mitigation was lacking. The citizens and voters of Tuscaloosa County are allowed to weigh in on the process at particular meetings scheduled according to the timeline. Although some Regional Commission's have Citizen Committees which are allowed to take part in the discussion process, WARC has no such Committee associated with the Eastern Bypass project. The WARC prepares data books for each of the 7 counties in the region. The books contain 2000 Census information for the counties, tracts, and municipalities. Maps of the counties and tracts are also included. In addition the books contain a list of the largest industrial employers in each county. A study of local soils conducted by USDA and Forest Service in cooperation with state agencies which shows the diversity and richness of various areas of soil in our county, including those along the Fall Line (Hurricane Creek) which is going to be bisected in several places by the current Eastern Bypass plan. Maps related to the Eastern Bypass. You can find more maps at the Alternate Routes page. 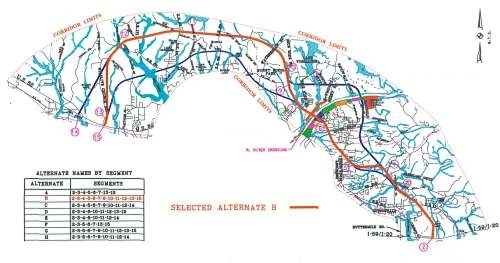 The route currently planned for the Eastern Bypass is Alternate B in the 1999 Final Environmental Impact Statement. Lake Tamaha is a Westervelt Communities development located between Holt and Alberta City. It is geared towards US students. Volkert is the consulting company who conducted a corridor study for the Eastern bypass. Often, a large transportation project will begin with a corridor location study that evaluates the potential impacts of the roadway or bridge and concentrates on minimizing adverse effects the project may have on the environment, businesses, residential areas, traffic, etc. The goal of the corridor study is to determine the overall best possible route for the new or relocated highway or bridge by taking into consideration engineering feasibility, cost, and environmental effect. Volkert, Inc., has conducted corridor studies for a number of state departments of transportation, municipalities, and other governmental bodies. Each study is unique in its requirements and approach, and Volkert's professionals make it a priority to insure that the engineering and environmental studies result in a signed Record of Decision (ROD) granting location for the project. This map is from the Final Environmental Impact Study published in 1998. Detail of Alternate route F.
The Federal Highway Administration requires Metropolitan Planning Organizations to publish a list of projects that were authorized in the previous fiscal year and involved federal highway or transit funds. A project is considered authorized when a funding contract has been completed. The authorized project list includes those projects from the Tuscaloosa area funded in fiscal year 2011, which ran from October 1, 2010 through September 30, 2011. The Transportation Improvement Program (TIP) is a short-range plan composed of a prioritized list of transportation projects. The TIP covers a four-year period. Generally projects on the TIP are taken from the current long-range transportation plan. The TIP is redeveloped every four years and is financially constrained. The purpose of a long-range transportation plan is to budget transportation funds over a 20-year plus time period so that future transportation demand can be met. The Tuscaloosa Area MPO is required to update the long-range transportation plan every five years. The MPO is required to balance proposed projects against expected revenue. The focus of the MPO's plan is on federally funded highway and transit projects. However all modes of transportation are considered, regardless of funding source. 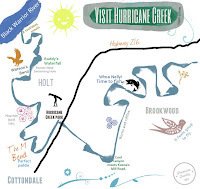 According to this plan, there is no such thing as Hurricane Creek Park. The citizen comments and letters include over twenty concerns about bike paths and only one reference to the Eastern Bypass on record. This indicates that either 1) enough details about the bypass plans were not communicated for public to comment or 2) FOHC did not make a strong presence at the public forum which allowed for comment. The Alabama Dept. of Transportation's Five Year Plan for road and bridge construction in Tuscaloosa County. Various local and regional agencies and groups play a role in selecting and finalizing the bypass plans. Here is how the process works and the role you can play in a democracy. 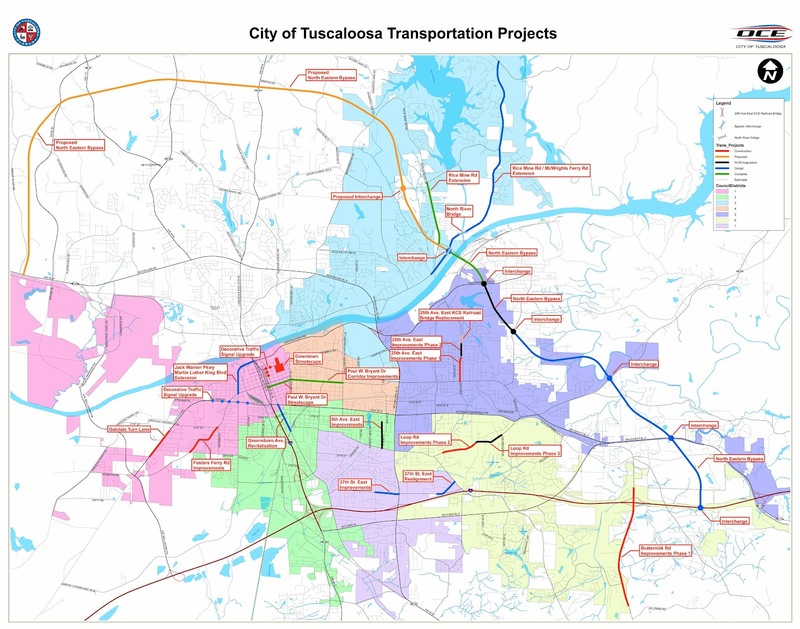 The Planning Agency Consultation Process for the Tuscaloosa Area Metropolitan Planning Organization documents how the MPO consults with other government agencies. The document is intended to prevent conflicts and promote coordination between the plans, programs, and processes developed by the MPO and other agencies. A brief summary of the Tuscaloosa Area transportation planning process. The document attempts to provide a basic understanding of the process. The Prospectus is intended to serve as an educational and reference tool for government officials and interested individuals. The Record of Public Involvement documents the public involvement activities of the Tuscaloosa Area MPO for a given fiscal year. The document includes news releases, legal ads, newspaper articles, the minutes of the MPO's Citizens Transportation Advisory Committee, and other items related to public participation. Organized in order of most recent to oldest. 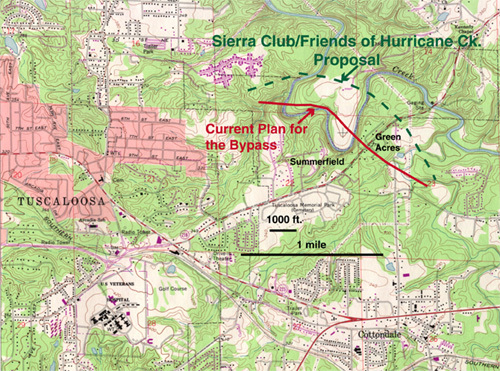 "Eastern bypass needs a bit more study", editorial, Tuscaloosa News, 17 December 2011. "Tuscaloosa officials collect bypass comments", Robert Dewitt, Tuscaloosa News, 13 December 2011.